Need more apps for your favorite device? iOSnoops can help! 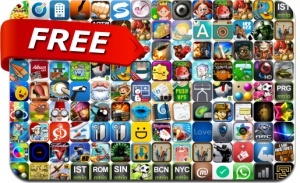 Here are 122 iPhone and iPad apps that have just gone free. This apps gone free alert includes Food Ninja, Ancient Puzzles, Santa Rockstar, Coin Drop, Diner Dash, Arc Squadron, Pixy Link, Freeze, Super Monsters Ate My Condo, Germz, Heroes Land, Great Little War Game, BattleLand and many others.